When I was a Boy Scout back in Missouri, along with knots and campfires I learned about our National Symbol, our bold, proud, Bald Eagle. I saw his image everywhere, on posters, flags, even coins. But I never saw one. If the bird was so all-fired important to our country, where were we keeping them? Asking teachers didn’t help, they didn’t know either. “Just believe in them,” I was told, “they’re real, even if you only see them on postage stamps.” So I believed in them and patiently waited, and finally, after what seemed an eternity, I saw my very first real live Bald Eagle—in a cage in the zoo. For a national symbol like the flag and the Pledge of Allegiance, shouldn’t Bald Eagles be thick in the sky and hanging around my school ground, I reasoned, like sparrows and crows? Surely they’d be easy enough to spot, with that white head and tail, and glistening black body. So where were they? I would have to wait, it seemed. 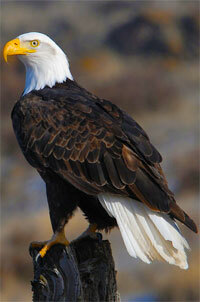 When I moved to California I read about a lake nearby where Bald Eagles were regularly seen fishing. So I drove there, binoculars in hand, and at long last I spotted my first wild flying Bald Eagle! This one skimmed across the lake, and with those great yellow talons scooped a large fish right off the surface. Just for my benefit. But that was 1960, and by then our national symbol was rapidly disappearing from American skies, and apparently no one knew why. Except Rachel Carson. In that year my mailbox at the university was daily stuffed with flyers condemning her for suggesting that the disappearance of the eagle was the result of pesticides in the fertilizers—produced by the companies who were sending me those flyers. The more we were becoming aware of the dangers pesticides posed for wildlife, the more strident became the lies of the industries that produced them—and consequently the greater the loss of wildlife. We all know the story and the eventual banning of such chemicals, and the passing of national legislation, the Environmental Protection Act and the Endangered Species Act, which were aimed at protecting our national wildlife. But administrations change, and a national government more concerned with the protection and wealth of industry threatens not only the well-being of wildlife but the health of society as a whole. When I went to Alaska for the first time in 1994 I watched Bald Eagles by the hundreds, feasting on salmon in the Ketchikan Gateway. Not all success stories are this vivid, nor are all declining species reversed, but we certainly know the process by now—of both losing, as well as saving a species from extinction, and the struggle is never ending. One day about a year ago, a Bald Eagle landed in a pine tree, here in my own wild garden, in Gulf Breeze. Later I watched it diving for mullet in my bay. Rachel Carson, we bless your memory, but we must continue to worry and we must continue to stay vigilant in the protection and health of our wildlife and wilderness treasures. National icon, personal treasure, you, great bird, are our true measure of what can be accomplished by people of determination and good will. But the work is not complete, the struggle is ongoing and being made more difficult by an indifferent national government. The determination to save the Bald Eagle in 1960 must remain the determination to protect all nature—all life on Earth.